Style and pizzazz are the best words to describe our handbag holder favors. A unique design by Cassiani collection favors , these stylish handbag holder favors are sure to be a hit with your guests. 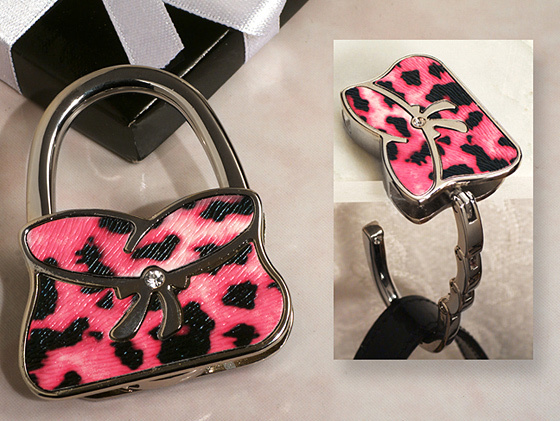 Each metal handbag holder is in a shape of a purse accented with a pink and black leopard design pattern. Chic and practical handbag holders are one this years most popular favors. Each favor comes packaged in an elegant two piece black gift box finished with a white satin ribbon bow and measure approximately 2.25" x 2.25".